Add a personal touch to your home with the Whitehall Cape Charles Wall Plaque. Each plaque is hand cast in recycled aluminum from a mold created specifically for your order, giving you a beautiful plaque in a single, durable piece. This plaque may be personalized with up to five 4.5" characters on the first line and up to seventeen 1.25" characters on the second line. 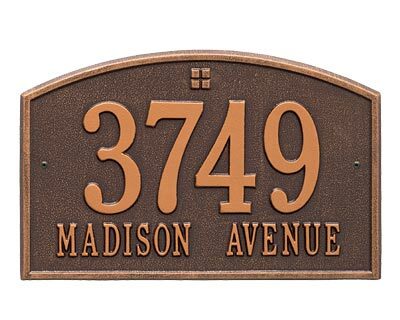 This attractive wall plaque will clearly showcase your customized information, year after year. This plaque may be wall mounted. Hand cast from recycled aluminum in the USA.